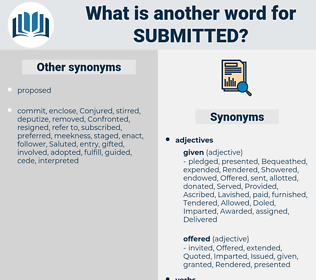 What is another word for Submitted? media, nominations, Records, discounts, announcements, drawbacks, Subjected, submission, submissions, Introduced, submits, Supplied, transmitted, Communicated, Provided. 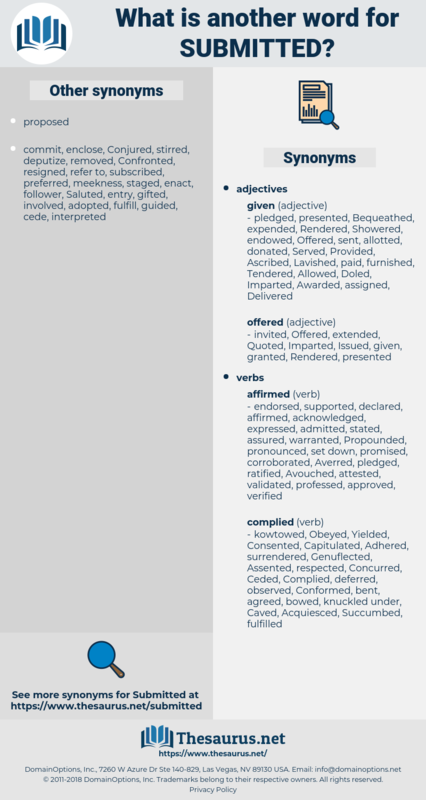 distributed, implemented, applications, summarized, published, surrendered, Participated, demonstrated, exhibit, exhibits, circulated, described, Contributed, Discussed, advised, remit, grievances, deposit, acknowledged, articulated, Obtained, informed, illustrated, imposed, formulated, Supplemented, Insisted, represented, Wrote, emphasised, Suffered, Progressed, Complained, initiated, executes, Notified, confiscated, Enumerated, promulgated, Instituted, emphasized, reaffirmed, inscribed, manufactured, completed, confirmed, finalized, Reiterated, endorsed, affirmed, considered, Imparted, Inserted, Mentioned, observed, Devised, restored, anti-personnel, opinions, reproduced, Examined, Asked, generate, Generated, understood, estimated, postponed, Complied, Envisaged, facilitated, asserted, Explained, Responded, appropriated, adopted, Invoked, broadcast, ministry, invested, increased, seized, purpose, applied, announced, question, Questioned, organized, Visited, Procured, recognized, addressed, Wished, thereon, mailed, Brought, highlighted, elaborated, Urged, dispensed, Bolstered, Tendered, Displayed, underscored, briefed, Cited, filled, draft, Drafted, move, moved, posed, fulfilled, contested, exposed, Became, texts, donated, procedure, built, Underwent, argentina, Extracted, showcased, bill, pledged, attached, Consigned, Arose, Deployed, Surveyed, unveiled, expressed, pointed, Commenced, Contended, Came, intended, rose, concluded, Pleaded, Pled, Upheld, Touted, conveyed, experienced, Cautioned, extended, continued, analyzed, Argued, Emerged, sponsored, enclosed, purported, sought, Inflicted, welcomed, Captured, lay, Demanded, Entered, Toured, Adduced, tables, retained, elevated, contacted, handed, mounted, attended, Yielded, advances, Nurtured, defined, painted, paints, directed, Stood, proceedings, Proceeded, conferred, drew, recovered, recorded, agreed, Told, Promoted, lifted, laid, department, noted, posted, governed, Occurred, reflected, Lodged, tested, Seconded, granted, opened, Created, alleged, exchanged, assured, revealed, Aimed, staged, Defended, seised, Returned, left, clarified, joined, pretended, found, Ceded, Objected, shared, related, decided, neglected, Believed, replaced, stressed, Caused, underlined, Passed, Floated, paid, Appeared, focused, focussed, Appealed, aired, Grabbed, spoke, Resulted, failed, grasped, showed, Arrived, project, Gained, author, added, Ran, runs, released, Helped, Flew, recalled, realized, Mended, fed, delayed, Served, Fielded, started, Awarded, Worked, Annexed, faced, Remarked, dropped, travelled, Voted, Met, Approached, voiced, Took, Allowed, Accounted, Launched, bore, reserved, Carried, opinion, product, form, formed, concerned, placed, ruled, hooked, Remanded, held, felt, Amounted, needed, know, backed, Reached, plotted, relayed, Had, Targeted, reasoned, led, gripped, heard, called, Ranged, Went, kept, covered, Happened, packed, wanted, headed, 21, Got, funded, Did, Dealt, She, shed, presented, submission, Introduced, tabled, Supplied, transmitted, Provided. resubmitted, sub-mitted, subscribed, substantiated, resolutionstabled, Reimbursed, distributed, resolutiontabled, admitted, solicited, committed, implemented, Administered, applications, supervised, incorporated, summarized, issuing, published, surrendered, observations, Participated, Emitted, summarised, demonstrated, Investigated, Subordinated, reintroduced, subjugated, withdrawn, Audited, evaluated, circulated, Waited, limited, Consulted, assembled, Disbursed, described, Scrutinized, Contributed, Discussed, advised, acknowledged, commissioned, articulated, composed, invited, Discriminated, edited, Obtained, informed, integrated, illustrated, imposed, subdued, formulated, assigned, Disseminated, secretariat, written, Supplemented, Inspected, hailed, authorized, split, itemized, Insisted, acquitted, represented, advertised, emphasised, Suffered, indigenous, Progressed, Complained, inherited, initiated, buttressed, prescribed, Notified, Negotiated, confiscated, characterized, documented, Enumerated, designated, Compiled, promulgated, Instituted, rescheduled, emphasized, justified, refurbished, Comprised, preferred, consolidated, Constructed, indicators, inscribed, manufactured, completed, confirmed, finalized, monitored, Adjudicated, accepted, endorsed, envisioned, ascertained, accompanied, abided, verified, removed, Extradited, considered, restricted, maintained, exploited, Imparted, organised, satisfied, Excluded, Inserted, combined, classified, Accommodated, Mentioned, acquired, assisted, entrusted, appointed, observed, Divulged, Devised, restored, Succeeded, updated, collected, measured, gathered, chairperson, reproduced, cooperation, Examined, Asked, Generated, understood, estimated, approved, re-established, abandoned, supposed, postponed, dedicated, calculated, Complied, co-sponsored, accomplished, facilitated, Tabulated, asserted, Explained, compressed, Responded, come, appropriated, adopted, questions, Invoked, complemented, Incurred, broadcast, ministry, invested, increased, seized, pursued, applied, announced, Questioned, organized, Visited, selected, disposed, declaration, Procured, recognized, interviewed, addressed, encouraged, renewed, associated, rejected, qualified, redrafted, Undergone, Confronted, united, motion, depicted, denigrated, destined, mailed, Brought, embodied, highlighted, imported, Betrayed, elaborated, Urged, complicated, acquainted, anticipated, bound, deadline, positioned, Been, dispensed, Bolstered, Tendered, Displayed, Proffered, underscored, retabled, briefed, Cited, allocated, filled, Drafted, moved, posed, specified, fulfilled, become, contested, exposed, structured, donated, Exempted, delineated, procedure, deferred, constrained, entitled, billed, Followed, arranged, built, reviewed, Managed, biased, obliged, Arisen, Extracted, showcased, enforced, involved, checked, equipped, attached, recaptured, studied, disciplined, smuggled, convention, reunited, located, risen, Purchased, Consigned, Deleted, settled, conceived, Enacted, Deployed, Surveyed, unveiled, expressed, pointed, Commenced, Contended, migrant, intended, Exercised, concluded, prevention, tied, engaged, comments, Pleaded, Upheld, conveyed, Receded, experienced, Impounded, clustered, extended, escalated, Enunciated, continued, Transported, redeployed, printed, routed, chosen, Argued, Advocated, Emerged, sponsored, enclosed, sought, devoted, tailored, relieved, Propounded, Inflicted, Begun, Captured, Encountered, diverted, Demanded, Entered, Rights, Adduced, contacted, inspired, handed, drawn, mounted, conditioned, Yielded, Nurtured, defined, painted, reminded, directed, Stood, Influenced, resolved, connected, recovered, undermined, recorded, Deemed, labelled, designed, advice, agreed, dumped, Told, Promoted, lifted, discharged, Trafficked, laid, data, noted, posted, Championed, governed, Occurred, reflected, Lodged, tested, granted, deposed, opened, Created, fixed, alleged, proved, proven, taught, exchanged, Challenged, assured, revealed, confined, Aimed, pressed, Defended, trained, seised, Taxed, Returned, left, Operated, clarified, Enabled, joined, Aggregated, l., solved, pretended, found, processed, copied, Devolved, financed, Answered, council, shared, related, period, crafted, Quoted, decided, Believed, secured, replaced, Killed, stressed, Caused, reopened, Passed, scheduled, arrested, divided, treated, grown, paid, spoken, Appeared, focused, focussed, session, response, Appended, formatted, Appealed, enhanced, aired, Grabbed, Resulted, projected, failed, Hammered, programme, Repaid, sold, authored, grasped, Beamed, worn, referenced, Arrived, Regarded, counsel, cast, Rated, stored, warranted, Underpinned, accessed, added, charged, or, released, Helped, refunded, Viewed, recalled, Cycled, thrown, fed, delayed, repaired, Served, healed, Marketed, Fielded, handled, started, learned, signed, Awarded, Channelled, Worked, protected, linked, expected, Profiled, taken, staffed, Annexed, faced, Borne, spanish, dropped, Afforded, travelled, Voted, tracked, fired, Met, Attacked, Approached, voiced, framework, Screened, Allowed, driven, landed, Accounted, Launched, Carried, text, reworded, opinion, grouped, Couched, seen, form, formed, concerned, scope, spelled, loaded, played, placed, Whipped, ruled, inclined, marked, heralded, Levelled, framed, packaged, known, controlled, held, felt, affected, planted, needed, aided, spread, broken, backed, Counted, c., planned, shaped, Reached, forced, relayed, Talked, Had, shocked, cleared, Judged, Targeted, Chaired, led, paved, heard, geared, called, Worded, 23, gone, tried, Phrased, kept, lawyer, covered, based, Happened, packed, read, sorted, effected, code, 47, headed, 21, Got, 32, funded, done, Acted, Dealt, Meant, shed, named, presented, Subjected, submission, Introduced, tabled, Supplied, transmitted, Provided. The young housekeeper, looking for a position in a first - class hotel, should read the following requirements, which were submitted to the writer by the manager of a first - class Western hotel a few years ago: A Housekeeper's Requirements. She submitted quietly to be led along the hall.